This artist book, designed and printed as a novel, presents a city of multiplication, where phenomena are not unique, but repetitions of each other. It reconstructs a pattern found in the immense archive of a street photographer working in San Francisco from the 40’s to the 70’s (the Joseph Selle collection housed at the Visual Studies Workshop). This pattern consists of images of people who look alike while they walk next to or behind each other on the street. Two of Us relates this to the notion of the ‘double’, a motif that is also interesting in the light of the technology of photography, seeing photography as a producer of doubles. The images of doubles are combined with a poem by Baudelaire, Les sept vieillards (in an English translation). The layout of the text causes a disjunctive reading of the poem. It has been broken apart into separate words, set, and rotated progressively at an angle below each photograph. Flipping the pages causes the words to move like the hand of a clock as the poem reads sequentially from front-to-back on the right pages and, on the left pages, from back-to-front. This movement causes the book to turn back on its own footsteps, instead of ending. Trod the same pace toward some end unknown. The book is related to In this Dark Wood that was published a year later. Black and white, perfect bound paperback. ISBN 0-89822-097-1. 424 pages. See more images of the book. Priced at 50 euro, plus shipping. Order through webshop. Order through email. Elisabeth Tonnard crafted a work of visual literature that caused time to stand still in a repetitive encounter with the most perplexing figure of modernity, the double. Two of Us makes a thought-provoking contribution to a growing body of theoretical literature on the different status of the flaneur in contemporary culture. 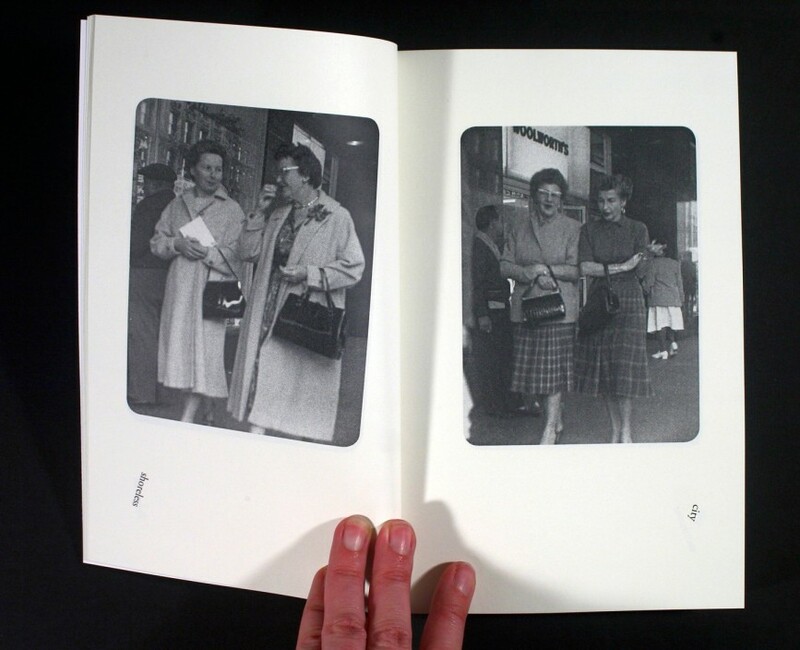 This artist’s book has the added merit of embedding theory performatively in the nuanced rhetoric of archival images. Chris Burnett in ‘The Streets of San Francisco’ Afterimage, vol. 35 no. 3, November 2007. The book is included in the collections of Albertina Bibliothek (Vienna), Bibliothèque Kandinsky (Centre Pompidou), Columbia University, Frac Provence-Alpes-Côte d’Azur, International Center of Photography Library (New York), Jan Michalski Foundation for Writing and Literature, John M. Flaxman Library at School of The Art Institute of Chicago (Joan Flasch collection), Kunstbibliothek (Berlin), Kunst- und Museumsbibliothek Köln (Museum Ludwig), MACBA (Museu d’Art Contemporani de Barcelona), MoMA Library, The Morgan Library and Museum, National Library of The Netherlands (Koninklijke Bibliotheek), Nederlands Fotomuseum, Otto G. Richter Library (University of Miami), Tate Library and Archive, The New York Public Library, University of the Arts London (Chelsea College of Art and Design), Yale University Library, Zentralinstitut für Kunstgeschichte (Munich).